The bilateral series between New Zealand and Bangladesh was the last ODI assignment for the Kiwis before the World Cup 2019 and they will be quite happy with their overall performance. They were clinical throughout the series and completed a 3-0 whitewash of Bangladesh. The visitors hardly had an answer to the Kiwis' all-round performance. In the first ODI, Bangladesh were bowled out for 232 after they won the toss and decided to bat first. New Zealand didn't have a daunting target and Martin Guptill's unbeaten century (117*) made it look like a walk in the park for New Zealand. Guptill batted through the chase and was well supported by Nicholls (53) and Taylor (45). The second game was, in many ways, similar to the first one. Bangladesh's another 225-ish score, another century for Guptill and New Zealand easily chasing down the target. In the third and final ODI, New Zealand batted first and made 330 for 6 in their 50 overs. Ross Taylor, Tom Latham and Henry Nicholls struck half-centuries while Colin de Grandhomme and James Neesham made useful contributions during the final overs. With 331 to chase, the visitors hardly had an answer with the bat as Tim Southee took 6 for 65 in his comeback ODI. Sabbir Rahman's maiden ODI hundred was the only positive for the visitors from this match, which New Zealand won by 88 runs. Here in this article, we will look at some interesting stats from the series. 1492 - Total runs scored in the series. 138 - Number of fours hit in the series, with Martin Guptill hitting the most (25). 24 - Number of sixes hit in the series; Martin Guptill topped the list with 9 sixes. 3 - Number of centuries scored in the series (Martin Guptill - 2, Sabbir Rahman - 1). 7 - Number of half-centuries scored in the series (Henry Nicholls - 2, Mohammad Mithun - 2, Ross Taylor - 1, Kane Williamson - 1, Tom Latham - 1). 118 - Number of runs scored by Martin Guptill in the 2nd ODI, the highest individual score in the series. 264 - Number of runs scored by Martin Guptill in the series, the most by any player. 135.0 - Batting average of Ross Taylor in the series, the highest for any player. 330/6 - New Zealand's score in the 3rd ODI, the highest team total in the series. 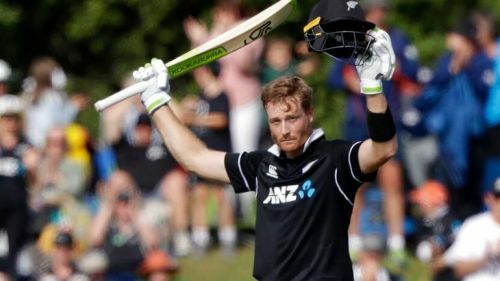 143 - Number of runs added by Martin Guptill and Kane Williamson for the 2nd wicket in the 2nd ODI, the highest partnership for any wicket in the series. 40 - Number of wickets that fell in the series. 6/65 - Bowling figures of Tim Southee in the 3rd ODI, the best by any bowler in the series. 4.10 - Bowling economy of Matt Henry in the series, the least by any bowler in the series (minimum 50 balls bowled). 9.33 - Bowling strike rate of Daryl Mitchell in the series, the best by any bowler in the series (minimum 50 balls bowled). 3 - Number of catches taken by Martin Guptill in the series, the most by any fielder. During his knock of 69 in the third ODI, Ross Taylor surpassed Stephen Fleming to become the highest run-getter in ODIs for New Zealand. With back-to-back centuries in the 1st and 2nd ODIs, Guptill has now 16 centuries, equaling Nathan Astle's mark. Only Ross Taylor has more centuries (20) than him for New Zealand.